Addiction is often viewed as a chronic disease ([link]). The choice to use a substance is initially voluntary; however, because chronic substance use can permanently alter the neural structure in the prefrontal cortex, an area of the brain associated with decision-making and judgment, a person becomes driven to use drugs and/or alcohol (Muñoz-Cuevas, Athilingam, Piscopo, & Wilbrecht, 2013). This helps explain why relapse rates tend to be high. About 40%–60% of individuals relapse, which means they return to abusing drugs and/or alcohol after a period of improvement (National Institute on Drug Abuse [NIDA], 2008). 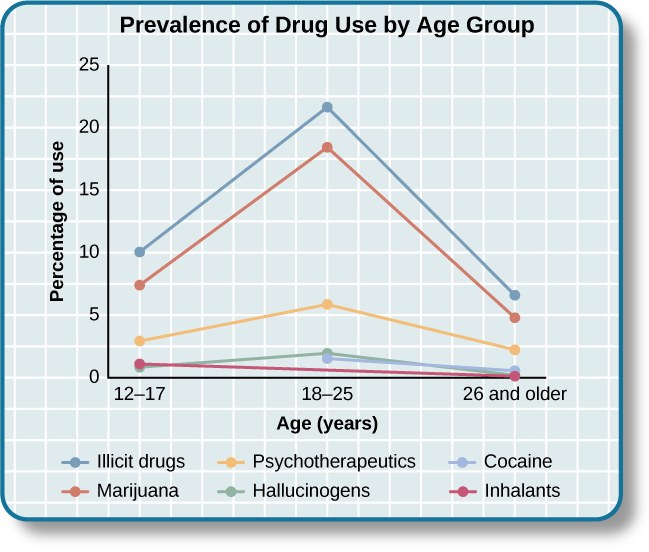 The National Survey on Drug Use and Health shows trends in prevalence of various drugs for ages 12–17, 18–25, and 26 or older. The goal of substance-related treatment is to help an addicted person stop compulsive drug-seeking behaviors (NIDA, 2012). This means an addicted person will need long-term treatment, similar to a person battling a chronic physical disease such as hypertension or diabetes. Treatment usually includes behavioral therapy and/or medication, depending on the individual (NIDA, 2012). Specialized therapies have also been developed for specific types of substance-related disorders, including alcohol, cocaine, and opioids (McGovern & Carroll, 2003). Substance-related treatment is considered much more cost-effective than incarceration or not treating those with addictions (NIDA, 2012) ([link]). Specific factors make substance-related treatment much more effective. One factor is duration of treatment. Generally, the addict needs to be in treatment for at least three months to achieve a positive outcome (Simpson, 1981; Simpson, Joe, & Bracy, 1982; NIDA, 2012). This is due to the psychological, physiological, behavioral, and social aspects of abuse (Simpson, 1981; Simpson et al., 1982; NIDA, 2012). While in treatment, an addict might receive behavior therapy, which can help motivate the addict to participate in the treatment program and teach strategies for dealing with cravings and how to prevent relapse. 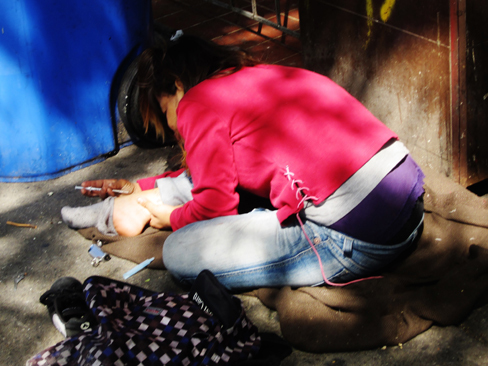 Also, treatment needs to be holistic and address multiple needs, not just the drug addiction. This means that treatment will address factors such as communication, stress management, relationship issues, parenting, vocational concerns, and legal concerns (McGovern & Carroll, 2003; NIDA, 2012). While individual therapy is used in the treatment of substance-related disorders, group therapy is the most widespread treatment modality (Weiss, Jaffee, de Menil, & Cogley, 2004). The rationale behind using group therapy for addiction treatment is that addicts are much more likely to maintain sobriety in a group format. It has been suggested that this is due to the rewarding and therapeutic benefits of the group, such as support, affiliation, identification, and even confrontation (Center for Substance Abuse Treatment, 2005). For teenagers, the whole family often needs to participate in treatment to address issues such as family dynamics, communication, and relapse prevention. Family involvement in teen drug addiction is vital. Research suggests that greater parental involvement is correlated with a greater reduction in use by teen substance abusers. Also, mothers who participated in treatment displayed better mental health and greater warmth toward their children (Bertrand et al., 2013). However, neither individual nor group therapy has been found to be more effective (Weiss et al., 2004). Regardless of the type of treatment service, the primary focus is on abstinence or at the very least a significant reduction in use (McGovern & Carroll, 2003). Treatment also usually involves medications to detox the addict safely after an overdose, to prevent seizures and agitation that often occur in detox, to prevent reuse of the drug, and to manage withdrawal symptoms. Getting off drugs often involves the use of drugs—some of which can be just as addictive. Detox can be difficult and dangerous. Watch this video to find out more about treating substance-related disorders using the biological, behavioral, and psychodynamic approaches. Frequently, a person who is addicted to drugs and/or alcohol has an additional psychological disorder. Saying a person has comorbid disorders means the individual has two or more diagnoses. This can often be a substance-related diagnosis and another psychiatric diagnosis, such as depression, bipolar disorder, or schizophrenia. These individuals fall into the category of mentally ill and chemically addicted (MICA)—their problems are often chronic and expensive to treat, with limited success. Compared with the overall population, substance abusers are twice as likely to have a mood or anxiety disorder. Drug abuse can cause symptoms of mood and anxiety disorders and the reverse is also true—people with debilitating symptoms of a psychiatric disorder may self-medicate and abuse substances. In cases of comorbidity, the best treatment is thought to address both (or multiple) disorders simultaneously (NIDA, 2012). Behavior therapies are used to treat comorbid conditions, and in many cases, psychotropic medications are used along with psychotherapy. For example, evidence suggests that bupropion (trade names: Wellbutrin and Zyban), approved for treating depression and nicotine dependence, might also help reduce craving and use of the drug methamphetamine (NIDA, 2011). However, more research is needed to better understand how these medications work—particularly when combined in patients with comorbidities. Addiction is often viewed as a chronic disease that rewires the brain. This helps explain why relapse rates tend to be high, around 40%–60% (McLellan, Lewis, & O’Brien, & Kleber, 2000). The goal of treatment is to help an addict stop compulsive drug-seeking behaviors. Treatment usually includes behavioral therapy, which can take place individually or in a group setting. Treatment may also include medication. Sometimes a person has comorbid disorders, which usually means that they have a substance-related disorder diagnosis and another psychiatric diagnosis, such as depression, bipolar disorder, or schizophrenia. The best treatment would address both problems simultaneously. What is the minimum amount of time addicts should receive treatment if they are to achieve a desired outcome? When an individual has two or more diagnoses, which often includes a substance-related diagnosis and another psychiatric diagnosis, this is known as ________. John was drug-free for almost six months. Then he started hanging out with his addict friends, and he has now started abusing drugs again. This is an example of ________. You are conducting an intake assessment. Your client is a 45-year-old single, employed male with cocaine dependence. He failed a drug screen at work and is mandated to treatment by his employer if he wants to keep his job. Your client admits that he needs help. Why would you recommend group therapy for him? The rationale behind using group therapy for addiction treatment is that addicts are much more likely to maintain sobriety when treatment is in a group format. It has been suggested that it’s due to the rewarding and therapeutic benefits of the group, such as support, affiliation, identification, and even confrontation. Because this client is single, he may not have family support, so support from the group may be even more important in his ability to recover and maintain his sobriety. What are some substance-related and addictive disorder treatment facilities in your community, and what types of services do they provide? Would you recommend any of them to a friend or family member with a substance abuse problem? Why or why not? Substance-Related and Addictive Disorders: A Special Case by OpenStaxCollege is licensed under a Creative Commons Attribution 4.0 International License, except where otherwise noted.